Show your love for the centerpiece of the Golden Gate National Parks with our brand new Cufflinks! Made with high quality materials with a reflective mirror finish, they are the perfect bit of flair to wear for any special occasion! One car and one bridge cufflink per set, comes in a re-useable box with foam padding. Adventure is calling, so don’t be late! Take flight to far-off places with this Golden Gate Bridge Watch. 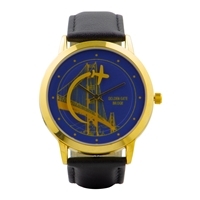 Showcasing a stylized silhouette of the Golden Gate Bridge, this timepiece is a great gift for travel-lovers of all ages—with a genuine leather strap, round blue-and-gold clock face, and a soaring plane second hand, it’s classic-style with a fresh twist. Dimensions: watch face approx. 1.5" diameter, strap width approx. 0.75", maximum strap length (buckled) approx. 8.25"